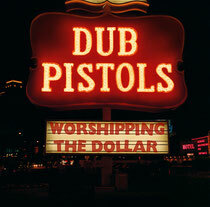 Taken from the Dub Pistols’ impending fifth album ‘Worshipping The Dollar’, comes ‘Alive’, featuring reggae legend Red Star Lion and the very radio-unfriendly D&B monster ‘Mucky Weekend’ with Rodney P. Remixes of ‘Alive’ come from Hackman, Urban Knights and Sunday Best along with instrumental versions of both. From their early beginnings as a sound-system project, Dub Pistols have grown into a party-rocking live band and their infectious blend of ska, dub, hip-hop, electronic music and punk has won them many fans around the globe over the past 15 years. Dub Pistols were justifiably voted the Best Live Act at DJ Mag’s Best Of British Awards at the end of 2011 and the band created their latest long-player in between gigs every weekend following the release of acclaimed 2009 album ‘Rum & Coke’. ‘Worshipping The Dollar’ sees a return to lyrical themes explored on earlier albums with deeper and more conscious lyrics and a pacier feel to the tracks, which mirrors their increasingly frenetic live shows. It’s out 25th June.